Apple is reportedly working on a peer-to-peer payment feature that will take on PayPal's Venmo app. According to the Wall Street Journal, unnamed sources say Apple is already in talks with Chase, Capital One, Wells Fargo and US Bank. No other information has been revealed, nor any indication on how Apple's peer-to-peer payment system would work, but it's easy to assume it will work within Apple Pay. 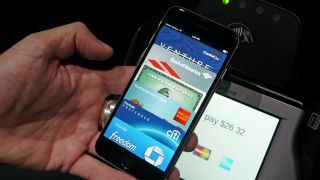 The report does say, however, that the new feature won't require banks to pay a fee for peer-to-peer transactions, even though Apple Pay requires a fee for all current transactions made from debit and credit cards. It's expected that if talks go well between Apple and the banks, the new peer-to-peer payment feature could roll out sometime next year. And if it does, you'll have another option beyond PayPal and PayPal's Venmo to pay back friends for shouting you dinner.